Lt. Gov. Tate Reeves will speak at the ceremony. Court of Appeals Chief Judge L. Joseph Lee will welcome guests and administer the ceremonial oath of office. Judge Tindell, 44, of Gulfport, took the oath of office Oct. 17, 2017. Gov. 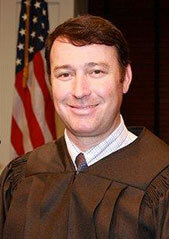 Phil Bryant appointed him to the vacancy created by the appointment of Judge David Ishee to the Supreme Court. It is traditional to hold an investiture ceremony at a later date. Judge Tindell’s children, Sam, John Thomas, Meredith and Henry, will lead the Pledge of Allegiance during the investiture. His wife, Claire Tindell, will assist with the enrobing. Judge Tindell served for six years in the Mississippi Senate from District 49. He was chairman of the Senate Judiciary A Committee, and vice chairman of the Senate Tourism Committee. He was an assistant district attorney for the Second Circuit District of Harrison, Hancock and Stone counties from 2002 to 2007. He entered private practice in 2007, also serving as a prosecutor for the city of Biloxi and as city attorney for the city of Diamondhead. He earned a master’s degree in business administration from the University of Southern Mississippi. He received a juris doctorate in 2001 from Mississippi College School of Law, where he served as student body president and earned honors of American jurisprudence in counseling and negotiations and domestic relations.